Growth Habit: Mirror bush can grow up to 8m in height, although it is almost always seen as a shrub between 1 and 2 metres. 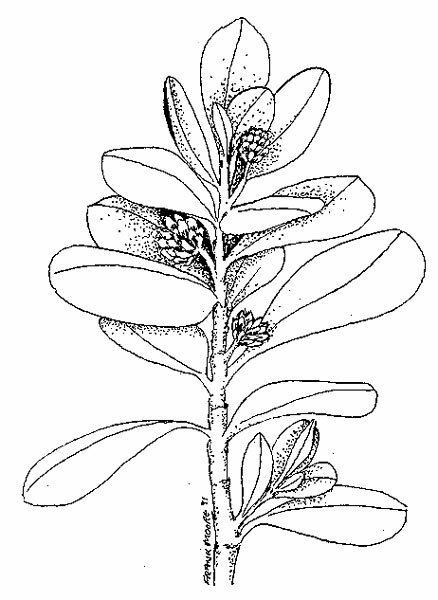 It was formerly a common garden plant, however it now exists in significant naturalised infestations in bushland. Type of Plant: A dense evergreen shrub or tree, with shiny, deep green leaves. Flowers: Inconspicuous flowers occur along the stem, but are normally hidden by the dense outer foliage. Fruit/Seed: Many small seeds are produced in bright red berries. Dispersal: Birds eat the berries and later pass the seeds. 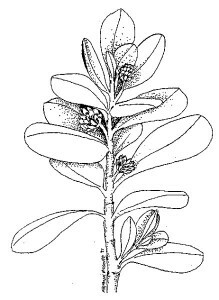 Distribution: Found throughout Tasmania in gardens, amenity plantings and bushland. Mirror bush is capable of forming dense colonies in native bushland, displacing native flora and fauna. Grubbing (all year). Small plants/ seedlings. Herbicide (summer, spring and autumn). Herbicides registered in Tasmania include glyphosate and triclopyr + picloram. The cut-stump technique is useful on larger plants.